Home Tampa Bay Buccaneers Are we there yet? Almost. It’s not hard to see that Tampa is heading in the right direction these days. They have two coaches that know how to win. They have a quarterback that knows how to win. And are 1-2 players away from having a very lethal offense. Tampa has a defense that will only continue to get better. Just how many more offseasons away are we from making a serious push for the Lombardi? I would say one more offseason is what Jason Licht needs to put together a team that can make a serious run for the trophy. Look, this guy knows what a championship caliber team looks like. He’s been around winning cultures most of his NFL career. He’s not interested in winning 2-3 years down the road. He’s ready to win now! He’ll surely go out this offseason looking to complete this roster using his mountain of cash and by using the draft. Tampa could’ve made the playoffs this season with a little more luck on their side. But, probably wouldn’t have made it all the way to the Super Bowl, due to lack of talent. However, we are not that far away from getting there. Licht will get this team the talent that it is missing and that will push them a couple more steps forward next season. Oh, and Jameis himself will surely attract players to want to come to Tampa and play for the Bucs. It’s an exciting time to be a Bucs fan. Fire the cannons! It’s an exciting time to be a Bucs fan. Fire the cannons! 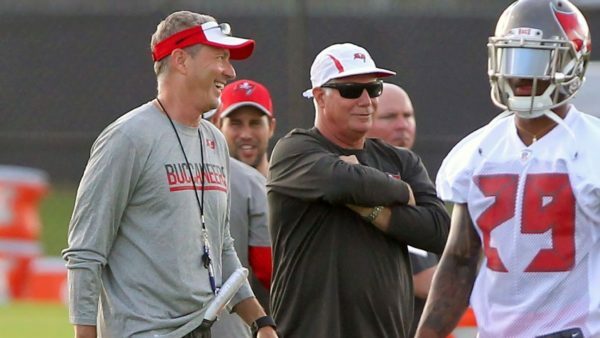 Is Dirk Koetter on the Hot Seat in Tampa? Is Having An Old QB Wear No. 14 The Key? Next articleForrest Lamp should be on Tampa’s mind during the draft.